I went to see the London Philharmonic Orchestra last night. I was reminded of 2 very important things. 1) I am able to sit still for approximately 5 minutes. 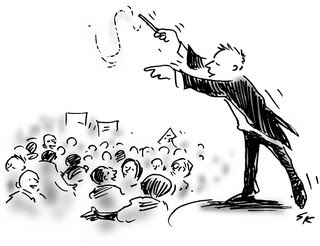 2) Conductors are like nagging parents or spouses. They stand there and tell you what to do over and over again, even though you're already doing it. But on the plus side, they are SO dramatic and definitely qualify for being male divas. Overall, being a well-cultured diva is hard unless you really like to pay attention. Hopefully one day I will be able to reconcile those two aspects of my life. Being a diva ain't easy, but it sho is necessary.